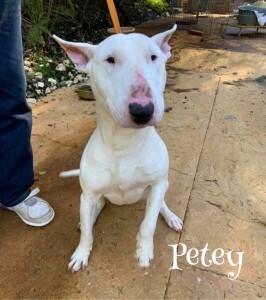 Petey – Sebastopol, CA | Bull Terrier Rescue, Inc.
Petey is a 1.5yo guy who thinks life is one big party! He loves to play with other dogs and came from a home with younger children. Petey is crate trained but may need a refresher on leash and house training. If you’re interested in this sweet guy, please complete our online application (http://www.bullterrierrescue.org/?page_id=572). Please contact Suz at suz@bullyhaven.org or 415-672-7391 if you have any questions about this wonderful fellow.